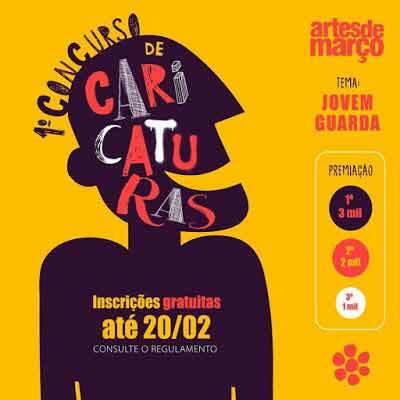 Teresina Administrator of Shopping Centers LTDA - Teresina Shopping 1st March Art Caricatures Competition 2019 Edition Commission. The contest is a competition between the "PARTICIPANTS", duly written in accordance with the terms of this Regulation. Second Paragraph: The Young Guard - was a Brazilian cultural movement that manifested itself in the mid-1960s, mixing music, behavior, and fashion. Appeared in August of 1965, from a television program shown by TV Record, in São Paulo, presented by the singers Roberto Carlos, Erasmo Carlos and Wanderléa. major national phenomena of the twentieth century. The Young Guard became the first musical movement in the country that put Brazilian music in tune with the phenomenon international rock band of the time, specially catalyzed by the Beatles. the date of closure of the entries, and after fulfilling all the requirements in this Regulation. 2.1 The purpose of this Contest is to encourage, disseminate and promote cartoonists, accordance with the terms of this Regulation, in addition to awarding prizes. b) personally at Teresina Shopping, at the Information Kiosk. c) Copy of personal documents (RG, CPF and Proof of address). 3.2.1 The PARTICIPANT shall access the Teresina Shopping website, at the link: http://teresinashopping.com.br/caricatura, in which, this will be available Regulation and the Entry Form, which must be printed, completed, signed and delivered or sent by email. arising from the violation of said legislation. (iii) the "Design" does not violate the rights of third parties, including, but not limited to, copyright and personality rights. Sole Paragraph: It is forbidden to replace the drawings delivered after the act of Subscription. vertivity of the information provided by the PARTICIPANT, which may, if to be disqualified. 3.7. All PARTICIPANTS shall complete and sign the Instrument of Accession and Acceptance at the time of registration, provided by the Contest organization available on page www.teresinashopping.com.br/caricatura. 3.8. There will be no registration fee for PARTICIPANTS. 3.9. Participation shall not be allowed for candidates who do not documentation requested in item 3.2 of this Regulation. PROMOTER of the Competition, for an indefinite period. 3.11. Failure to comply with the instructions of this Regulation will declassification of the works. 3.12. PARTICIPANTS under 18 (eighteen) years of age must be represented by their parents or legal representatives, and it is not possible to register without.